My studio is a smallish room upstairs behind the kitchen. At first I thought I would sleep here, too. I did so for a couple of weeks. Then I decided that if I were to paint here that might not be a good idea due to the fumes. Stairs to the studio. Behind the double doors is the laundry room. Panning to the left. The door on the right leads to a nice 3/4 bath. to the right you can see the screened in porch at the back of the house. Looking into the kitchen from the dining room. That door leads to a narrow inset porch. Things are stored there. Ladders, grills, and such. The door leads to the dining/living room. The walls are not really this bright. The painting is by Robert Gratiot. The doorway leads to the front stairway. And, of course, every two story house needs a door to the exterior from the stair well. There used to be a fireplace over there. My sideboard would look great there if only it weren’t broken (my fault, poor packing of the POD). The door on the left leads into the kitchen. Painting by me and a chair that is so ridiculously ornate I had to buy it. The simplicity and graceful curves of the newel post are what sealed the deal for me. Even the ceiling is papered in this area. Top of the stairs. Someday sewing area. On a whim bought a queen size mattress and moved into the bedroom. Sculpture by Audra McKay Webster. Luckily the windows are shuttered to the top as there is a very bright streetlight out there. The only closets in this house are the laundry room and the water heater closet down stairs. And I still have lots of boxes to unpack. This area…. a closet? It is totally open. But it is a large enough area that I can use it as an exercise room. Upstairs bath. That window, looking toward the rear of the house where you can see the roof of the kitchen and the wall of the studio. Two person shower and a large soaking tub. Totally wasted space. The wall that separates the bathroom from the ‘workout closet’ is 8 feet high but the ceiling is 10 feet high. So, in effect it’s an open room. Can you imagine showering or bathing in such a drafty place in the winter? Unfortunately crooked photo of a very sweet room. Book cases on either side of the fireplace. Front door. Notice it has a bell for ringing… broken. Oatmeal Coconut Cookies: Could this be cookie heaven? 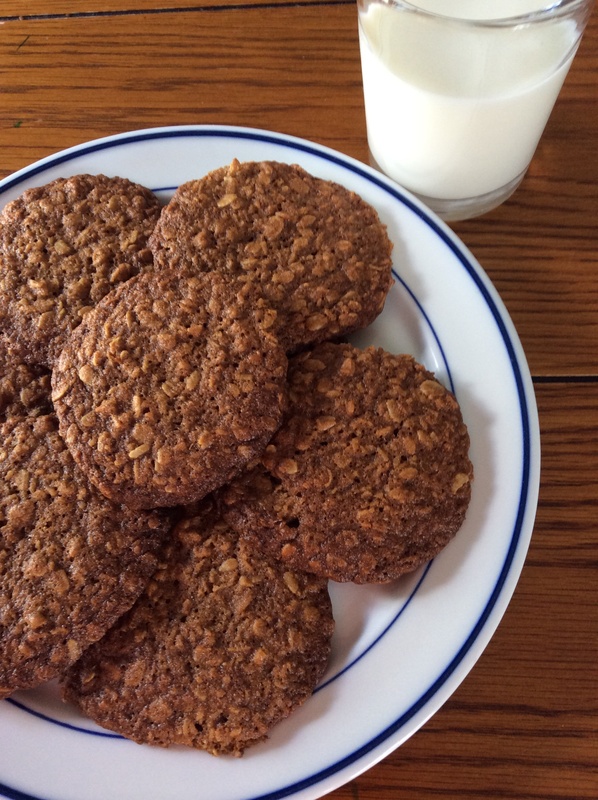 But these oatmeal cookies are a delight! The edges are crisp. The centers soft, chewy and moist. The flavor!!!! Even my grandson preferred these oatmeal coconut cookies over the Ghiradelli Triple Chocolate Brownies that were his other dessert option. I made some slight changes to FarmGirl Fare’s recipe. I changed the brown sugar to coconut sugar (to lower the glycemic index a bit) and used raw sugar instead of regular granulated sugar. Oatmeal Coconut Cookies – makes about 3 dozen. Heat the oven to 350 degrees. Line a heavy duty baking sheet with unbleached parchment paper (when I bake cookies, I just use the same piece of parchment for the entire batch). Melt the butter and place it in a large mixing bowl. Using a large rubber spatula, stir in the coconut sugar and raw sugar. Add the vanilla, milk, and eggs and stir until well combined. In a bowl mix the flour, baking soda, salt, and cinnamon together. Add to the wet ingredients and stir until blended. Stir in the oats and coconut. Using a 1½ Tablespoon round scoop, drop the cookies onto the prepared baking sheet (12 cookies per sheet – they spread out while baking). Bake until golden brown, about 13 to 15 minutes. Transfer the cookies to a wire cooling rack. 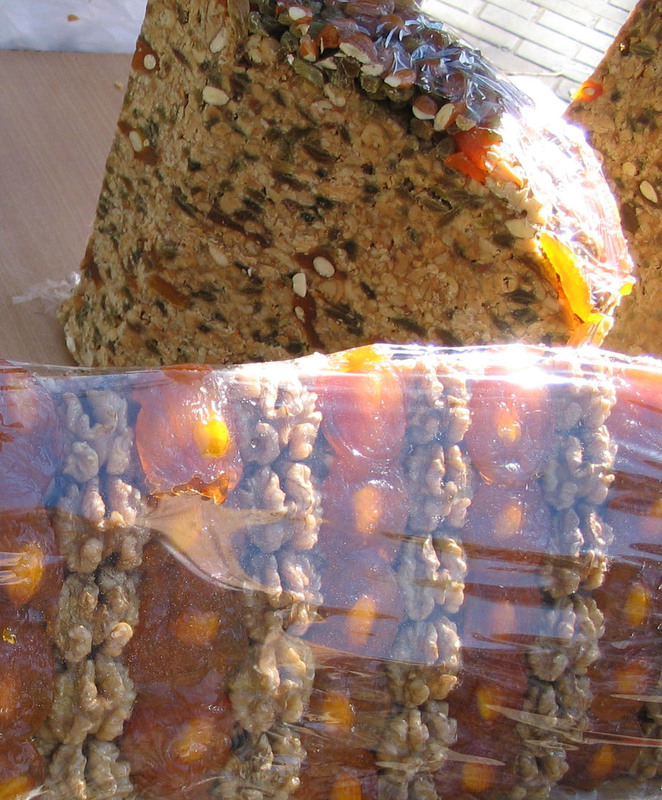 Store in an airtight container for two to three days or freeze. I was just getting out the Baker’s Chocolate to make some of these yummy but not bad for you treats when I remembered I promised my son-in-law the recipe. So, here it is, Bryant. 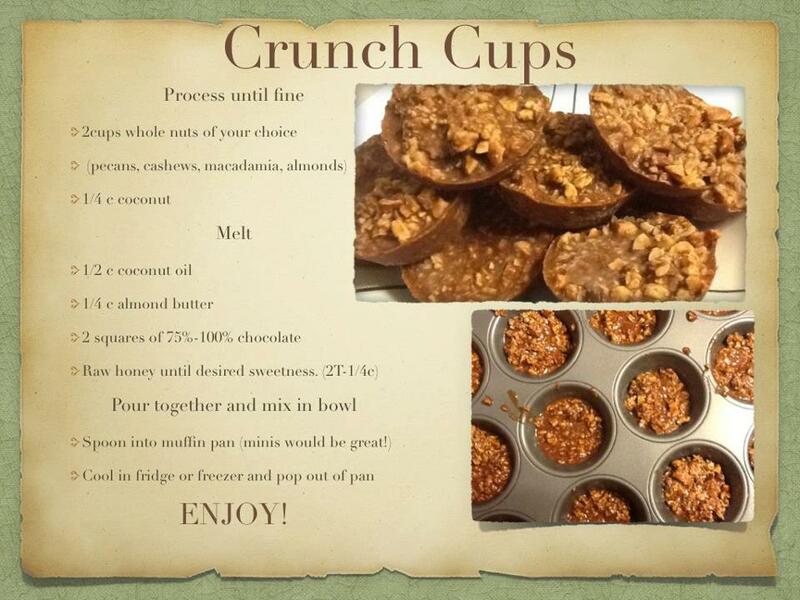 This is based on a recipe found on the internet called Crunch Cups. I will include that recipe at the end. Caveat: This is pretty good but not high end gourmet stuff. But you also don’t have to feel bad about eating it as it has a minor amount of sugar in it. And that sugar has a low glycemic index number. 20 minutes or until solid. 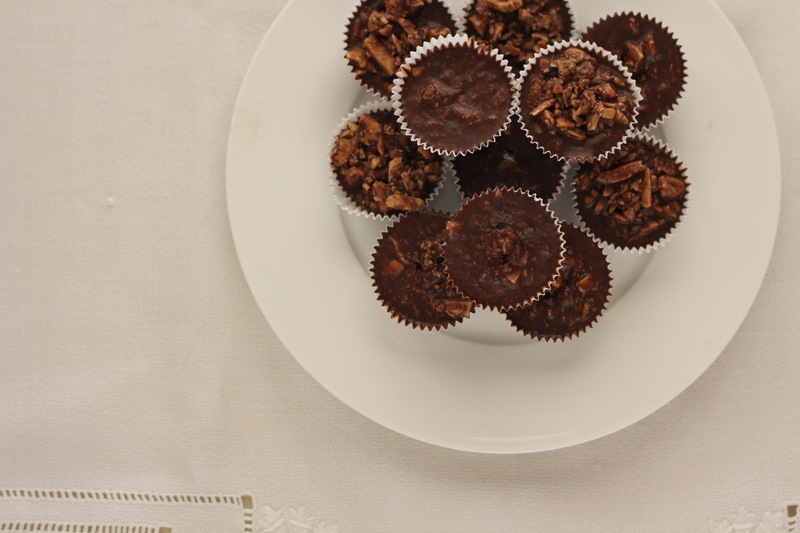 *If you make them in full sized muffin tins there is no need for the paper liners. Simply insert a table knife down the side and pop them out of the pan. 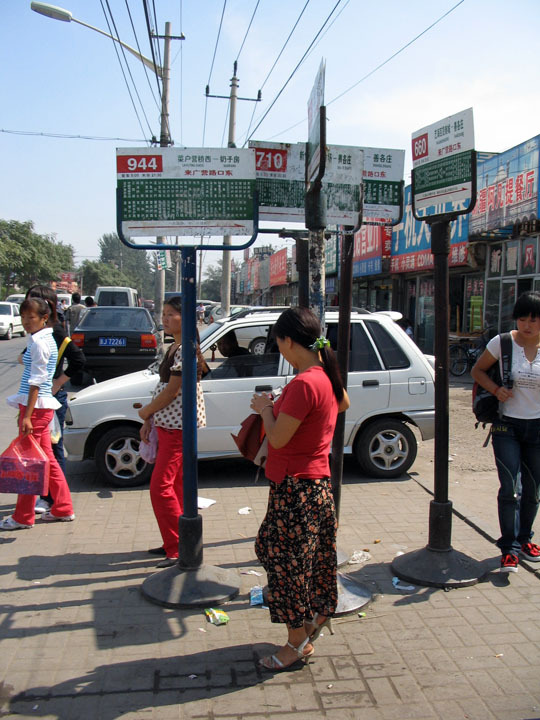 A couple of weeks ago, the Sunday I discovered it is not a good idea to go to ‘the Sunday Market’ on a Sunday, at the Dashanzi bus stop I heard a voice say, ‘Lady, look’… if you have been in Beijing for a while you know to resist those words with all your will. But then the voice said, ‘Halvah’. Oh, word i recognize. I turned around. Propped up on his bicycle was a long piece of plywood with a 36 inch slab of heaven. It was beautiful. He said, ‘Halvah, try. ‘ I said ‘Woa bu yaow’ (Don’t want it)out of habit as well as principle. He raised his sharp and alarmingly large butcher knife and sliced off a sliver for me to taste. eyes, long nose. I said, ‘Hao’ (okay), though normally, I’m not a halvah fan. looked puzzled . Then he said ’20 kwai a kilo’. Not knowing how much a kilo is I said, ‘Ee guh’ which means ‘one’. He sliced it, he weighed it, he wrapped it up and handed it to me. I said, ‘xia xia ni’. He looked a bit puzzled again. As I sat on the 998 bus going home greedily picking off pieces to nibble I pondered what an odd looking Chinese person he was and how strange that this Chinese street vendor should be selling a Middle Eastern treat. I was back at the studio before I occurred to me that the man hadn’t been Chinese (Han, anyway) at all. AND that I hadn’t even occurred to me to speak English to him even though he spoke it to me. The bus is so crowded with bodies I wonder how any more can squeeze in but they do and the small attendant with the harsh high thin voice moves through. She always knows who has paid and who has yet to pay. I hold on tight to the high rail as the bus wobbles back into traffic, the driver laying hard on the horn to let others know to make way. Other vehicles /cars, motor bikes, three wheeled motorized-and non motorized carts, bicycles/ honk in reply. Whenever a driver (bus, auto, other) pulls into traffic on the narrow road an accidental death is a possibility. In Beijing traffic you only pay attention to what is ahead of you. Drivers are constantly being cut off and worse. but every body honks or beeps to make their others aware of the ensuing action. The roads are kind of noisy. garrishly colored, shabby shops wth laundry hung out on the fences that surround them, and women in doorways squat to scrape vegetables for lunch. Fairly often in the long line of shops you will see an ornate metal gate thats wide enough for 3 or 4 cars to pass through. Inside, around a parking lot you see more small shops of the same type as on the road. The road is two lane blacktop, more or less. we cross a small canal, then a rail road , then a forested area. Beijing is heavily forested. 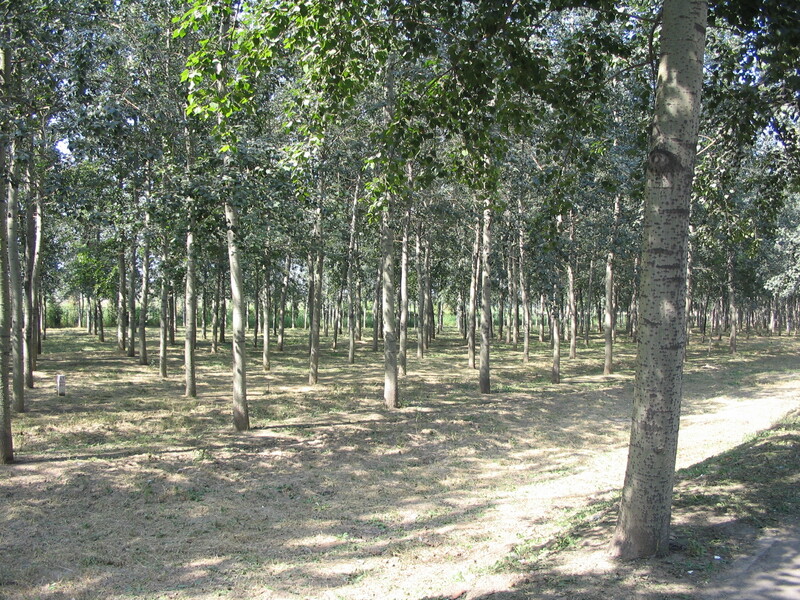 What’s odd about it is that the trees are of the same age and type,and planted in rows. they all appear to be 30-40 years old. I have read that, during The Great Leap Forward, all the trees were cut down to fuel the furnaces to melt ore (and household pots and pans) for steel. So these are about the right age to have been planted after that disastrous time. 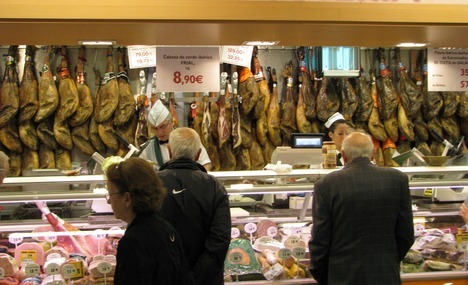 In a grand supermercado, such as El Corte Ingles you will drop off your packages and backpack at the guardaropa (coat check) the attendant will give you a number in return. Pay attention to what pocket you put that number in! Make sure you have some 1 euro coins In supermercados like Carrefore and Mercadona make use of the available lockers to store your, packages, backpack, carrito (granny cart), etc. You will need a coin for that. Pay attention to what pocket you put the key in! You will also need a coin as a deposit on a shopping cart. You will get the coin back when you return the cart. While you are in line watch what people in front of you are doing. When they get to the cashier, do the costumers put the money or card on the tray? If they do that then you do that, too. Also pick up the change or card from the tray. For the time being, single use plastic shopping bags have not been banned. But you will be charged for them and you may be asked how many you want. You are expected to bag your own groceries. Do you remember the best way to pack a grocery bag? Watch the baggers at home if you don’t remember. AND remember to pick up your packages, carrito, and backpack at the coat check or out of the locker. I don’t know how many times I have been so distracted by the novelty of the experience that I did not pay attention to where I put the coat check number or the key to the locker. A couple of times I completely forgot I had left anything behind until I was back out on the street. 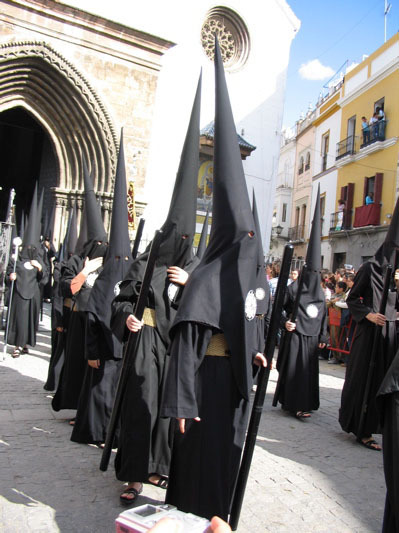 My favorite time to be in Seville is Semana Santa. Every year at this time I grow nostalgic for late March 2005. I loved being part of the crazy crowds holding their collective breath as the palio dips down to clear the arch of main door of the church. The quick gasp of terror as it appears to fall only to be caught and pushed back up level. 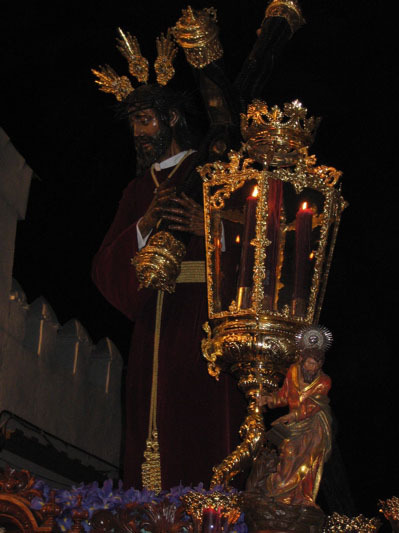 Semana Santa – “Holy Week” – is the period preceding and including Easter. 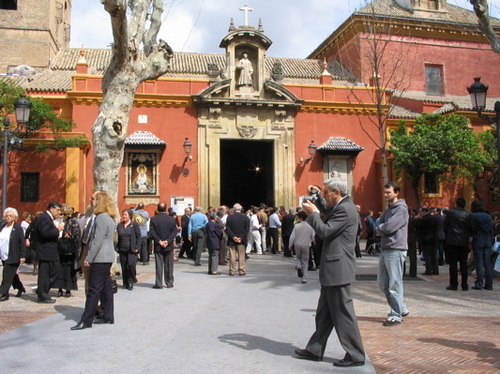 Between Palm Sunday and Easter Sunday, Sevilla turns into a city “held hostage” by ritual. Although these rituals are centered on the death, death and resurrection of Jesus Christ and the worship of the Virgin Mary, it would be hard to say that the fervor and devotion shown during this week has much to do with Roman Catholicism or even God. It is a week of tradition; a time where being “Sevillano” means something special and social life is lived between processions in the bars and cafés of the city. 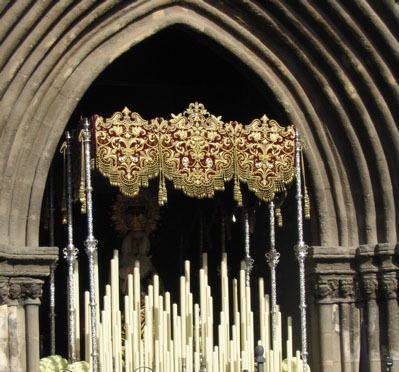 This is where Semana Santa starts for most people. On the Saturday before Palm Sunday, all the chapels, temples, basilicas and churches from which holy week processions will leave are open for people to visit the religious icons and images that will be carried through the streets of the city. 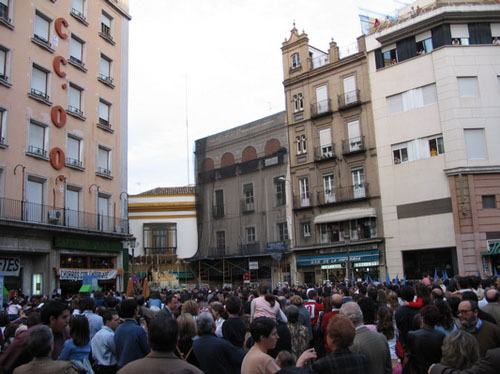 Crowds are a guaranteed during Semana Santa. The overall population of the city swells exponentially, all the hotels are full and there are too many cars… But people are in the street and a good time is to be had by all. Forget what you wanted to do in the centre of town this week. You’ll be stopped at every turn by the famous “bulla” (sudden apparition of thousands of bodies to see a procession) and you’ll be endlessly frustrated by the amount of time it takes you to get to where you want to go. Just enjoy the week’s festivities and don’t make a lot of plans to get things done. I know they look like members of some strange order of the KKK, but I assure you they aren’t. 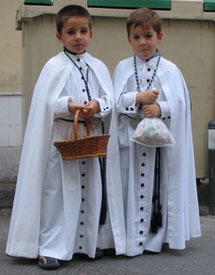 They are “Nazarenos”, members of “Hermandades” that organize these processions during Semana Santa. Their garb pre-dates the KKK by a quite a few centuries. It takes time to get over the weird feeling you get when you see them. 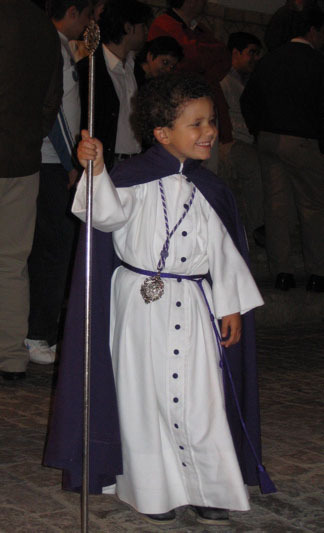 There are between 300 and 3000 Nazarenos in each procession. They usually hold very tall candles called “sirios”. Their livery varies in color depending on the hermandad. After a bunch of Nazarenos, the Cristo comes out. Every procession has these big float like platforms called “pasos” Most processions have two pasos: a Cristo and a Virgen. 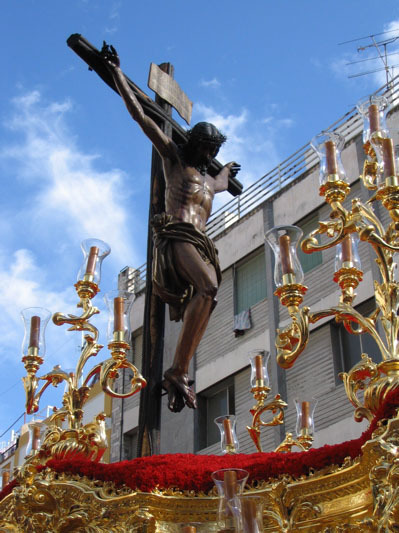 The Cristo can be a depiction of the crucified Christ or a scene from one of the Stations of the Cross. The Virgen is a depiction of one of the many apparitions of the Virgin Mary. 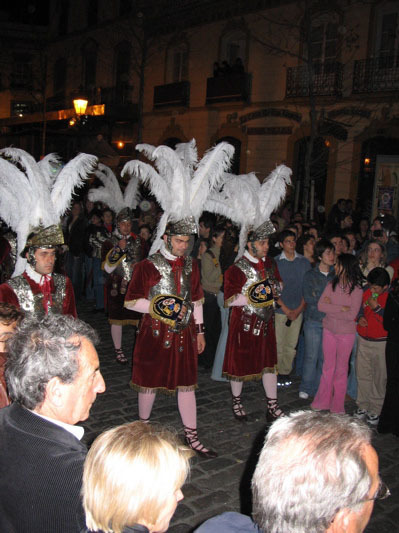 The pasos are carried by 18-30 men called “Costaleros”. They carry the pasos on their backs and are located underneath. The Cristo is usually followed by “Penitentes”. 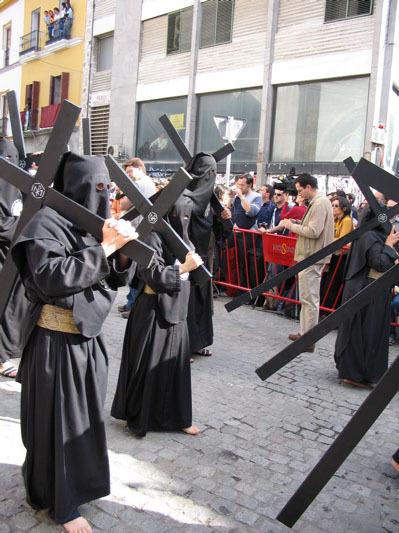 Penitentes carry crosses during the procession in penance for some sin or to fulfill a promise made to God. Some carry more than one cross. I saw a guy carrying 6 crosses strapped together this year. He must have felt really guilty about something or be really thankful for something. 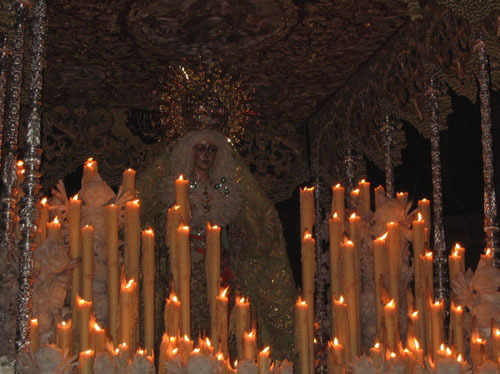 After Penitentes and more Nazarenos comes the “Palió”, the paso that carries the image of the Virgin Mary. This is a particularly famous image called “La Virgen de la Macarena”. Her Basilica is pretty close to our house, so we run into her every year. Her procession comes out in the wee hours of Thursday night/Friday morning and lasts over 13 hours. Devotion to her is unparalleled. I’ve talked with people that don’t believe in God, but they believe in the Macarena! The Macarena has her own legion of Roman soldiers. They precede the Virgen with wailing trumpets and pounding drums. These guys are the party animals of Semana Santa. They are usually a hundred strong at the beginning of the procession, but very few actually finish it the following day. Most get lost in the cafés and bars of the city living it up with friends. One big party! Maundy Thursday is a day of morning in Spain because of the crucifixion of Christ. All the women dress in black and most wear a large comb in their hair on which they drape a huge black lace veil. Men wear black too, usually three-piece suits. Semana Santa involvement is something that is passed down from generation to generation. No belief is really necessary. We have friends that have converted to Buddhism, but continue to be in two processions in the city. They have already passed this tradition on to their children.